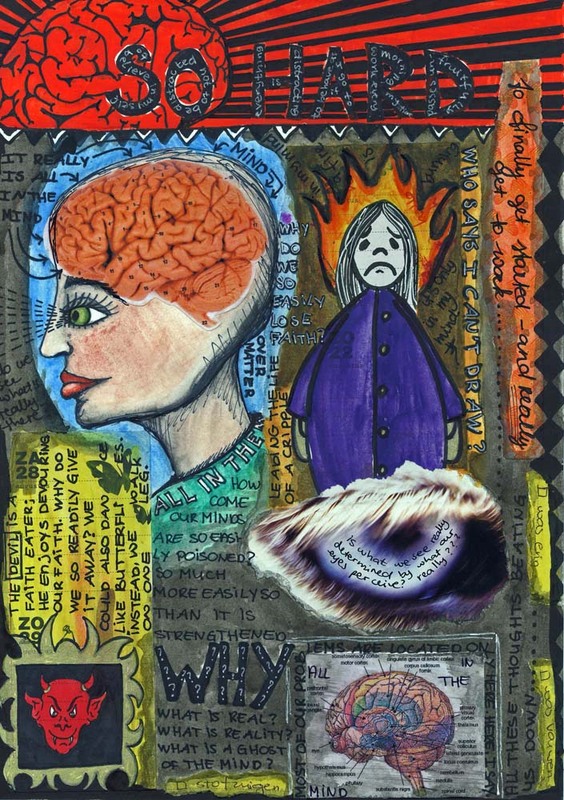 I spent the past few days reading books by Lynda Barry. And her books hit home. It’s a clear case of reading the right thing at the right time. You know, there are great books out there. But sometimes you have to read a book at the right time in order to hear what the writer’s saying to you. I experienced a similar thing a couple of years ago. I was trying to lead a “normal” life. Being a good mom, looking out for a job. But inside I felt very unhappy. I didn’t want to get a job. Not because I was lazy. Not because I didn’t want to have a 9-to-5 existence. It was none of that. It was hard to explain, but I felt that there was something inside me that needed to get out. That I needed to bring out into the world. And somehow I knew I had to walk the artistic path. And at the same time; me and art? I was so bad at drawing? And I don’t walk around looking like an artist. I was never the avant garde trendy and popular extravagant girl. And I was raised to think I should have a decent job. I was pushed to university. And I’m really glad that I worked so hard and graduated. And I even did a master’s. But still. It wasn’t really me. I needed to express myself. But didn’t really know how. I danced a lot when I was young. And I wrote poetry and spent nights on end drawing. But I was poor at it, to art standards. So how was I thinking that I should walk the path of art? Then somebody gave me the book “Jonathan Livingstone Seagull” by Bach. And the story hit me hard. That gull was me! For some reason I had a hard time fitting in wherever I was. And committing to things that normal people were committing to. And I was disappointed with myself for it. But when I read Jonathan Livingstone Seagull, I finally understood that even though my path wouldn’t be paved or easy, I would have to walk my own path. That realisation was a liberation. A very freeing and powerful experience. And then life slowly came back and the wonderful feeling of finally getting it faded a bit. And then a move across the country came and the feeling faded so hard until it vanished completely. And I lost touch with myself. I knew in my mind somewhere that I had to get back to my path, but I didn’t know the way. I didn’t know what to do. I forced myself to sit down to work and get busy. I was frustrated and stressed out. It didn’t work. I had lost touch with myself. My world of imagery had gone. I couldn’t find it anymore. I could only think. But thinking didn’t get me there. And then I ran into Lynda Barry’s books. And ordered them. And read them. And then a second sense of liberation came. It was almost as if Lynda Barry had written her books especially for me. She woke the slumbering creative energy inside of me. It was really as if dark clouds were lifting from my mind and I suddenly knew where I was heading again. I can see my path right before me now. Such a wonderful thing!!! Isn’t it wonderful how what somebody writes in one time and on one place can hit somebody’s heart in another time, on another place? Isn’t that exactly what I want to do with my art? I would never think that my art is technically exceptional, for it isn’t and never will be. But I believe I have stories to tell, stories to share, hearts to touch. And I think I can do that with my art. And that is all I want to do. And help other people to find their creative voice. My path is here before me. And all I have to do now, is cherish it and be patient. Make notes for when the time to work is there. So that I cannot forget. And work whenever I can. It’s so great to finally really be back at work! Not just sitting down, doing something, but working with my heart and soul again. Yay! I’m back! hoi Mandy, bedankt voor je leuke kaart die ik gisteren ontvangen heb, ik zou je graag iets terug willen sturen maar ik heb je adres niet. Vandaar langs deze weg. Ik blijf je nog altijd volgen op jouw site en ik hoop dat je binnenkort online gaat met teken/schilderlessen.